Daily Survival: be safe during... a flood. be safe during... a flood. we'll go through these a few at a time. no need to get all gloom-n-doom and overwhelmed at once. so, if you chance to meet a flood, what should you do? planning ahead -- well first let's address what you should have done already - have insurance. yeah, it's kind of a drag - but it's important. FEMA released a statement in 2005 saying: "flood insurance is affordable. everyone needs it. it is the first line of defense to protect against the cost of flood damage." since i'm no insurance pro, i won't go through the technicalities of the policies; i will leave it at this: insurance - it's important, so look into it. and then get it. if you don't know where to start, google it. vehicle safety -- if you're at work, or outside your home and are worried about a flood coming, you may think you'd best be getting in your car to get home. ironically, this might be the most dangerous choice. 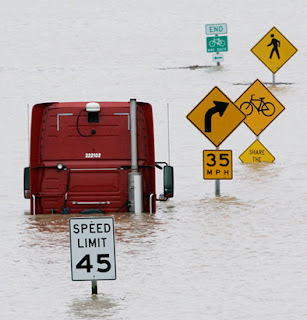 texas has the highest number of flood-related fatalities, almost all deaths were vehicle-related. most cars will float and be swept away in 18-24 inches of moving water -- and don't think because you have a van or suv that you're safer than the mazda miata next to you. you're not really. if your car is swept away, it will likely roll or even flip over entirely. once this happens, you have only seconds to escape the vehicle - and can you even imagine trying to undo those tricky carseat buckles when really, all you want to do is panic? so what should you do if you're out driving (or about to drive home)? just hurry up and wait for the rains to pass; resist the urge to rush home during heavy rain. remember: turn around, don't drown! watch for animals - many small animals, including snakes, can be pushed from their homes and may try to join you in yours. so keep your eye out for them! watch where you step - the ground can become covered with debris, including broken glass. or, it could be very slippery with mud - so tread lightly. clean everything that got wet - in a flood, the waters can pick up sewage and chemicals from roads, factories, businesses, storage spaces and many other undesirable places. food, cosmetics, medicines can all become tainted if they get wet - when in doubt, throw it out! have your emergency kits handy - if you are told to evacuate, do it. it will be way simpler and safer if you do it when first advised instead of holding out. and take your emergency kits with you. make sure your whole family knows of your emergency communication plan and that you have all decided what to do in an emergency (where to go, who to call, where to meet, etc.). and if you have pets, don't forget to plan ahead for them as well. most importantly, do not underestimate the destructive power of a flood. it is more than just a little rain.